I’m writing this to let you know that we have scheduled a meeting (meeting subject) with some renowned contractors (a type of meeting) on coming [Date: DD/MM/YY] from [Time to Time] here in our office (Hall/any other place). (Describe in your own words). Could you please confirm the availability of Hall no. 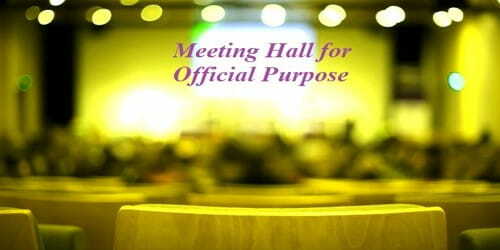 *** to conduct the meeting as the number of participants is expected to be around (Invitee number) and this Hall has sufficient seating place. We will also require the support of projectors so kindly also organize the same by coordinating with the IT team. (Describe your requirements). Appreciate if you could confirm the above before COB today so that I can send the invitation to all the participants accordingly. My organization (Name) is conducting a one-day training course (the type of meeting) for its staff and would like to rent your meeting room (meeting purpose) for the purpose. The course will be held on [Date: dd/mm/yy], from (Time to Time). The staff in attendance would be no more than (Invitee Number). (Describe in your own words). We also request you for the use of its facilities that includes chair-table, a projector, and the sound system. We have booked a caterer to handle the refreshments and lunch. Rest assured that the room will be maintained in good condition during the activity. (Describe your requirements). Kindly provide us with the terms and conditions about renting your meeting room, so that the activity could proceed smoothly. Hope the venue to be available on the required date. You can reach me via Email: ***@mail.com or via Phone: 000000. Thank you very much. I look forward to hearing from you soon.